We realise there are many people based at home who can benefit from our facilities. Let us work together to represent your business in an efficient, professional manner. By utilising our facilities on your letterheads you can take advantage of the benefits of an office, without the overheads or staff of your own. 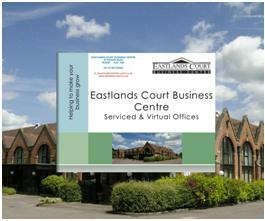 Why Choose Eastland Court's Business Package? You need a first class image. You're missing calls because you're out. You're working from different locations. You need a base, but not a full time office. * Please note that this is a postal service only and does not include for the delivery of large parcels or packages. For under £2.20 per day register for our telephone answering package. All calls will be answered in your company name, messages taken and relayed on via email. Calls can also be trunked through to mobile or landlines (please note that call charges will be incurred). For £3.60 per day the above 2 packages combined. Our meeting room facilities are available for all virtual packages at £8.50 per hour or £50 per day. Refundable deposit equivalent to two month's fees. Minimum 3 months. For a "virtual pack" (including terms and conditions) designed specifically for your personal requirements please telephone or email alternatively print off and complete our Virtual Office Agreement below and return to us with the original relevant proof of identity. Please note that in accordance with the Money Laundering Regulations 2009, original proof of identity (passport or picture driving licence) together with latest utility bill is required upon signing and return of the Agreement.